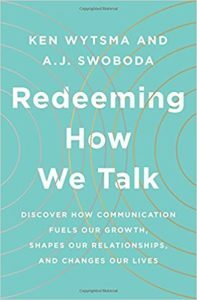 Redeeming How We Talk is a necessary and timely book. Words matter. Poor words matter. Good words matter too. In fact, as the authors make clear at the beginning of the final chapter through the words of Samuel Beckett, “words are all we have.” Our very existence has been spoken into existence. Unfortunately, we live in a time of carelessness when it comes to words. We can spew our vitriol to the masses, all the while remaining anonymous. More than ever before, it is easier to surround ourselves with like-minded people, never allowing ourselves to engage in thoughtful and challenging conversation. (Read about “confirmation bias” in ch. 2). Instead, we choose rhetoric and propaganda (ch. 2). “We communicate, but we do not always converse” as the authors say. Civil discourse has become a thing of the past, generally speaking. It has not always been so. The authors speak of the famous gathering known as The Inklings. C.S. Lewis’ brother Warren said of The Inklings, “We were no mutual admiration society. . . . To read to the Inklings was a formidable ordeal.” But this is how we are shaped, through challenging yet hospitable conversation. In this book, the authors move through various topics and employ various disciplines to point to the necessity of the redemption of our speech. They also note that this redemption will, by necessity, be rooted in silence. “There is a posture of the heart that allows for real conversational connection. If we cannot practice it by ourselves, and in the presence of God, then we won’t be able to practice it in the stress and conflict of our social relationships. This is our challenge: to find ways back to being fully human. Without this, we cannot redeem how we talk.” The wonderful contrast between cold silence and warm silence in chapter 7 is fantastic. Isn’t this understanding necessary? Not only our silence before our Creator but also the formation of the heart for true communication are rooted in the presence of God. The authors point out many of the obstacles that currently stand in our way to hospitable conversation but point towards a proper understanding of “godly speech” (ch. 7). Even our theology, they note, can be godly or ungodly (ch. 8). Part of the solution to redeeming how we talk, particularly in a digital age, is a robust theology of incarnation and imago Dei (ch. 3). This book is a wonderful place to start in reclaiming both. A book about our current communication crisis could be doom and gloom. This is not that. I found a lot of hope here, even as the authors painted a truthful picture. This, of course, is the way of hope – truth spoken (or written) leading, sometimes painfully, to redemption. My hope is that this book is not only widely read, but also put into practice in our homes, communities, and even digital spaces. *The advance copy of this book was provided by NetGalley and releases June 5th, 2018.